All inclusive Gambia holidays are in the smallest African country on the continent’s west side. It has a small Atlantic coastline and is surrounded by Senegal. It is linear in length and its border surrounds the Gambia River and the hills around it. All inclusive 2019 / 2020 packages to Gambia are on probably one of Africa’s most unusual countries due to its unusual shape swallowed up by Senegal centred around the Gambia River. Flight time from UK: 6 hrs aprox. There are several ways to travel around on Gambia holidays. 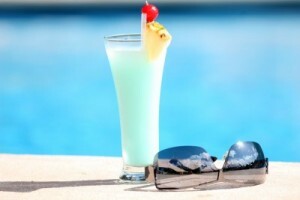 It is increasing in recognition with northern Europeans at the minute as holiday operators there are currently branding it as something different from the normal package holiday. Visitors from Britain and Ireland, New Zealand, Australia, Singapore, Malaysia, Taiwan, Finland, Denmark shouldn’t require a visa to cross into the country and stay for up to 90 days. However it is always wise to check before you make travel arrangements. 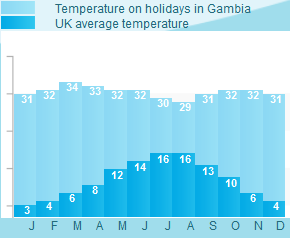 The peak tourist season for holidays in Gambia is between October and April and direct flights are available at the minute from major European airports including Manchester, Amsterdam and Brussels. Below is some important information to remember in Gambia. The two main taxi services in Gambia are Sept-places and Bush Taxis. Both firms run from Dakar to Bunjal and Bunjal to Ziguinchor. If you would like to rent a car on your all inclusive Gambia holiday it is best to choose a nice air-conditioned four wheel drive vehicle if possible. Some roads are mostly dirt tracks and can be treacherous so do be careful. Contrary to belief Gambia is sophisticated enough to provide full English breakfasts and other old favourites like Chinese and Indian cuisine in most of their hotels and restaurants. Don’t be afraid to try the local cuisine which includes mostly rice and meat such as chicken or beef.